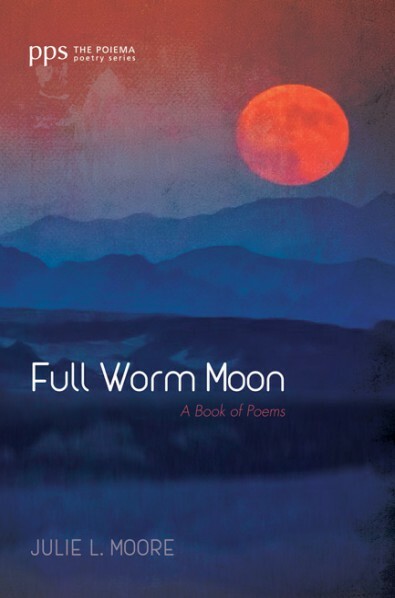 “’What if the beautiful day is over?’ wonders Julie Moore in her shattering new collection, Full Worm Moon. And indeed, poems about the end of a marriage wring the reader. Cycling through a year’s full moons, these poems bear witness to ridicule, violence, and pitilessness. But wait–just as prayer can exorcise broken promises, so too can the natural world’s rising sap and irises mirror and enable human healing. Observing a birch tree, Moore writes, ‘Lean in. Listen to the soft/cellular breath tell you what it can.’ These poems are rich with empathy for all living creatures, especially the exploited and abused. It’s not hard to imagine Jesus striding through the cow pastures and Little League stadiums of Moore’s poems. Amidst the world’s disarray, Moore’s playful wit and exultant language ultimately proclaim the persistence of tenderness, peace, and love. beneath the low Lenten Moon. “Full Worm Moon” first appeared in The Christian Century. as some sort of penance. He owns the house, too. scales of justice in the budget. everything is, how nothing adds up. She deciphers how to breathe only when he leaves. I am the magpie, sitting atop the wattle fence. all resting there on Normandy’s ground. or fly, depending on my need. so all summer long, I sang of solitude. to walk around the body & wail. the one with a brush in his hand. “In Which the Magpie Resurrects the Voice of Henry David Thoreau” first appeared in The Ekphrastic Review. Dayton.com listed Particular Scandals as one of ten must-read books by Dayton, Ohio authors. It was the only book of poetry to make the list. Released in 2013 from WordTech Editions, Slipping Out of Bloom can be purchased through the publisher’s website or from the author directly (see the contact page on this Web site). 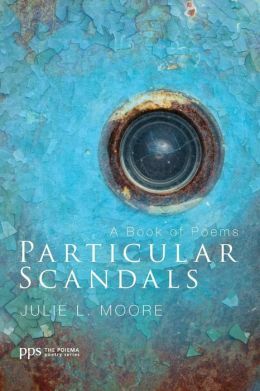 The world’s stubborn strangeness, its painful loveliness, and the search for traces of God amidst its people and creatures—Julie L. Moore braids all of these obsessions beautifully together into these luminous, resonant, unflinching poems, and somehow finds hope for this world among it all. 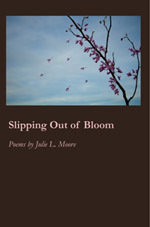 The poems of Julie L. Moore’s Slipping Out of Bloom reveal an edge: fine, sharp, reflective, dangerous. She acknowledges lines that unite us and divide us yet lingers over the enchantment born from a fruitful blurring of those borders. Moore has lived to tell us about the places in our world where the delicate and the durable meet and merge. The sheer and piercing audacity of her words will wake you to the sound of your own breathing. These poems are crafted from Julie L. Moore’s daily life—walking Maggie the dog, sawing up a beloved, fallen tree, playing Scrabble with her family, noticing how leaves are strewn like letters across a flat, Ohio lawn. Her poetry refrains from overstatement and extravagant gesture. It delineates many subtle colors on the palette of human suffering and faithfully documents nuances of joy. What a rare pleasure to read a book so honest, so humble, and so utterly trustworthy! In Election Day, Julie L. Moore unearths the beauty and frailty in both the natural world and the landscape of pain. Negotiating the often blurred boundaries between visible and invisible realities, her poems traverse the expanse between awe and uncertainty, perseverance and surrender, tough questions and even tougher answers. Finishing Line Press is a critically acclaimed poetry publisher based in Georgetown, Kentucky. In addition to the Chapbook Series, of which Election Day is a part, it publishes the New Women’s Voices Series and sponsors the Finishing Line Press Open Chapbook Competition. Finishing Line Press and editor Leah Maines were featured in both the 2001 and 2002 Poet’s Markets.